Ha-Siddur Ha-Shalem (The [Complete] Daily Prayer Book), translated and arranged by Paltiel Birnbaum, was widely used in Orthodox and Conservative synagogues until the late 1980s and remains a favorite prayerbook for many who grew up using it. First published by the Hebrew Publishing Company in 1949 under their copyright, this siddur is in the Public Domain in the United States due to the lack of copyright renewal required for works published in the US between 1923 and 1963. The Cantors Assembly of America had the segment of the siddur containing the Birkat Hamazon (Blessing after Eating the Meal) published by itself as the benscher, Rabbotai Nevareḥ (1954). The benscher included notes to the popular Ashkenazi tune of the birkat hamazon provided by Moshe Nathanson. This benscher is also in the Public Domain in the United States due to the lack of copyright renewal required for works published in the US between 1923 and 1963. 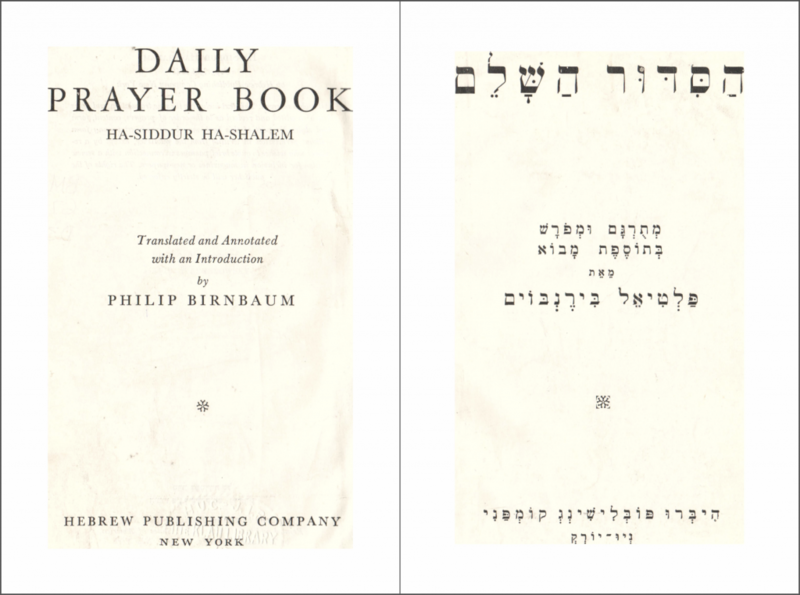 “הסדור השלם | Ha-Siddur Ha-Shalem, The Daily Prayerbook by Paltiel Birnbaum (Hebrew Publishing Company, 1949)” is shared by Paltiel Birnbaum with a Creative Commons Public Domain Dedication 1.0 Universal license. Please reciprocate for any adaptation or redistribution of this work by (1) properly attributing the work to Paltiel Birnbaum, (2) clearly indicating the date you accessed the resource and whether any changes have been made (and if so, please be in touch with us and leave a comment below so that we might note your adaptation or improvement), (3) providing a link back to this source, and (4) specifying the Creative Commons Zero (CC 0) Universal license a Public Domain dedication under which this work was shared. 2018-09-19 – 11 Tishri 5779 at 10:29 pm · Reply. Aharon, your scan allowed me to compare the original edition to the more commonly found 1977 reprint. 1. The bulk of the siddur, from pages 3-4 (Birkhot ha-Shahar) through pages 789-790 (Prayer for the Welfare of the State of Israel) seem to be identical. I found no evidence of any text that was changed or even newly typeset. I haven’t checked every single page, but the rule seems to have been that the pages were simply copied as they were. However, this rule is not fully true at the very beginning of the siddur, nor at its very end (as follows). 2. On the main title page, the original היברו פובלישינג קומפני was changed to בית ההוצאה העברי in the 1977 edition. 3. At the very beginning of the siddur, after the table of contents and before the introduction by the editor and translator (Birnbaum), there is a page for acknowledgements in the original edition. This page is missing in the 1977 reprint (perhaps because it thanks a number of scholars who were associated with JTS). 4. Birnbaum’s introduction is significantly longer in the 1977 reprint than in the 1949 edition (xxxiii pages versus xxiii pages). The difference seems to be that in the later introduction there are four sections, and in the original one there were only three. Section II of the newer introduction, which is about the meaning and history of Jewish prayer, seems to be what has been added, because the other three sections of the original introduction don’t seem to have been changed (they appear as sections I, III, and IV in the 1977 edition). The entire introduction was newly typeset in the 1977 edition in order to accommodate the new material. 6. As mentioned above (1), the very end of Birnbaum’s siddur in its original 1949 edition was with pages 789-790 (Prayer for the Welfare of the State of Israel). But in the 1977 reprint supplementary material was added after this on unnumbered pages. The first page is in Hebrew, and contains the songs “Yerushalayim” (מעל פסגת הר הצופים…) and Ha-Tikvah. The facing English page is the first of five that contain devotional material in English on the following topics: Israel, Prayer and Devotion, Eight Degrees of Charity, Brotherhood, Rules of Conduct. The final unnumbered page at the back of the siddur contains a transliteration of the Mourners’ Kaddish.